We don't have a television, but we do buy DVDs of films and television series to watch on the computer. One of the benefits of watching DVDs is the extra features they contain, including "making-of" documentaries and commentaries. I have learned a lot about film-making and story-telling from these features. Originally, it was usually the director who recorded a commentary. 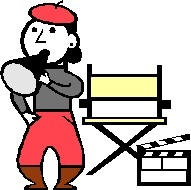 Film directors are considered the auteurs of the film, and have overall artistic control. Later, other team members also started recording commentaries, including producers, writers, and actors. As commentaries have become a standard item on so many DVDs, I have found out what sort of things I find interesting, so here is my personal guide to what makes DVD commentaries interesting to me. First of all, it would be good to know when the commentary was recorded. Sometimes it seems that the DVD commentary was recorded before the film was released, so the makers don't yet know how the film was received by the public. Since the DVD is usually released 6-12 months after the cinematic release, it seems to me worth waiting to see the public's reaction, and then perhaps some of the criticism can be addressed. A commentary should be both educational and entertaining, telling the audience how the film was created and why certain choices were made. The speaker should remember that the commentary is aimed at the viewing public. In some cases, speakers like to give credit to various members of the cast and crew. This is fine, but it should not turn into a mutual admiration club. Actors in particular seem to love praising each other's performance, and telling viewers what lovely people the other cast members are in person. This is not relevant to the viewers and seems gossipy. Speakers should also have with them at the recording a complete list of the names and functions of everyone involved so they don't have to say they forgot someone's name. Directors can give the viewer an overview of the entire film, and also discuss various aspects of the film-making process. They are usually capable of explaining the decisions they took in an interesting way, perhaps because throughout their work they have to explain everything to the other team members. Writers can focus on how the story was originally written and constructed, and how the various other elements available in film played into the story-telling. When the story is adapted from a novel or other previous work, it can be interesting to hear in what ways it differs from the original, and the reasons for these differences. Producers are very familiar with decisions regarding things like filming on location or on set, special effects, and how cast and crew were recruited. The role of the producer used to be less well-understood than that of the director, but perhaps these commentaries and documentaries are helping to change this. Actors are often the least interesting of the speakers on commentaries, and I think they would do well to think in advance of how they wish to present their craft to the viewers. For example, I would be interested in knowing when the script was revised, when certain lines were improvised, and how the actors thought they were portraying their characters. Actors can have some interesting insights into the characters they play and their motivations. In some cases, actors speak in different voices or accents in the film, and then it would be fun to hear how they acquired the necessary accent, whether it involved dialect coaching for this particular film or was something they already knew how to do. Actors like discussing the locations and sets, their costumes, the weather during filming, and when they were acting to a green screen. It could also be interesting to know what they were actually eating or drinking in scenes involving eating and drinking. Sometimes they have to learn particular specific skills for a film, such as playing an instrument, riding a horse, sword fighting, etc., and viewers might enjoy hearing about their training process and how much is the actor's own performance and how much is a stunt person or double. To conclude, I would like the speakers to think of the DVD commentary as a chance to educate viewers about their particular crafts and skills, and to explain the roles of various team members, techniques, and other factors in making a complex collaborative piece of art. I look forward to seeing how commentaries on DVDs evolve in the future.